I got bitten by the stargazing bug a few years back, basically when I realized that I could buy a budget telescope and do some stargaze and not need a huge telescope like you see in the movies. Anyway, while I have my own awesome reflector telescope, I have been lucky enough over the last month to be given the opportunity to put to the test some fantastic telescopes. Stargazing is something I love to do with my two boys, so I was sure to let them have a go to as stargazing can be an excellent family activity. Anyway, grab your coffee and check out these five telescopes. First, one I got to try was the Celestron 21035 70mm Travel Scope which is an awesome budget priced telescope which can be bought for well under 100 bucks. Actually, the version I was sent came with a cool carrying case, but you can get it without and that lowers the price by around 20 bucks. Ok, so the first thing that captured my attention with this telescope was the way that it looks just so high quality. It is made from strong aluminum and honestly, even if you have never stargazed a day in your life, you will have no trouble at all setting this up and as a matter of fact, you do not even need a tool box or anything like that to get it up and running. So once you have the telescope all set up how does it compare to another reflector telescope? Well considering this is a budget telescope, the quality is pretty good. The Celestron 21035 70mm Travel Scope comes with two lenses. The 20 mm lens lets you have a magnification up to 20X and the 10 mm lens gives you 40X magnification. This is impressive and on a clear night, you can easily see the moon or if the Earth is just right, even some planets. It really is quite exciting to use and the tripod they give you with this is awesome and also felt very sturdy, my son used this and put it on a table and with the legs, all the way up it works great as a table top tripod as well. A big deal is made with how clear the glass is and I have to agree, it does give you a very sharp image of whatever it is you are looking at. The only negative I would say is the plastic finder scope which does feel a little cheap, but at this price point, you really cannot complain. The Orion 10034 GoScope II 70mm Refractor Travel Telescope Moon Kit for a budget telescope really does have an impressive look. Most of the telescopes I have looked at are black, but this one here is a bit more classy as it is red. This is a refractor telescope and even though it is low in price (around 80 bucks) it is very well made. This is certainly aimed at kids and newbie stargazers as the idea is you just pick up the travel bag it comes with and you can take it anywhere you want, open the bag up and it is ready to go. The actual telescope is as you can see very strong and well made, even down to the finder scope and the eyepiece. But what really took me by surprise in terms of the quality was the tripod. Now I have kids and they have a tendency to rock the telescope when they use it. But as all the legs are connected to the center pole, the tripod is very, very sturdy and I really liked that. We spent quite a while with the Orion 10034 GoScope II 70mm Refractor Travel Telescope Moon Kit and my eldest son got a real kick out of being able to clearly see the craters on the moon. A very nice bonus is the Orion Moon Map that came with it, which my youngest son spent more time looking at than through the telescope! You get a 25mm and a 10mm eyepiece with the telescope which give you in Orion’s words, a 16 and 40 power views. In all seriousness though, you will be very impressed with not just how far you can see, but how clear the images are and this is because of the glass they have used. Oh, one other thing I forgot to mention is that this budget telescope is fantastic if you like to look at nature and the great outdoors. One thing I will say is that while the finder scope is great, it can take a little fiddling around with to get things as clear as possible. Ok so the Celestron NexStar 130 SLT Computerized Telescope is not exactly a budget telescope. But I was fortunate enough to get to try this bad boy out and I spent a wild weekend with it! As this is a Celestron, it has a very strong quality to it. I know that some of you may see the word computerized and think that this must be huge, but this is surprisingly compact and takes up very little space. While this may be a little more high-tech than the other two I just talked about. The Celestron NexStar 130 SLT Computerized Telescope is actually very easy to use. There is a bit more of a learning curve with this, but once you get the hang of it and really know how to use the software it comes with. This along with the SkyAlign system make locating celestial objects incredibly easy. Of course, as this has a higher price tag, you are probably wondering just what makes it worth that money. Well, the fact it is motorized means that you pretty much tell the telescope what you want to look at, it locates it and then you just look for the eyepiece and gawk in amazement. From the moon to the rings of Saturn, you are honestly going to be blown away by how clear the things you look at are. If you want a telescope that offers more than just your standard reflector telescope this is for you. The highest level of magnification that this offers is a phenomenal 72X which with how high quality the glass lenses are is why you can see so far and so clearly. There are a couple of small issues that I feel you should know about and the first one is the battery. It requires 8 AA batteries to function and they do not last as long as I would like. Of course, if you have higher end batteries it will be better. But I strongly suggest you have at least 24 batteries with you if you are going for an all night stargazing session. Next, up, we have the Orion StarBlast 4.5 Equatorial Reflector Telescope which when it was sent to me is going for under 200 bucks which in all honesty is a steal considering the quality. The first thing that took me by surprise was the size of this telescope. It is very compact and takes up next to no space. It looks far bigger in pictures than it actually is. The telescope is made with strong aluminum so it is very robust. Along with this, the tripod is designed just the way I like it. It gives you a really sturdy platform and if you have kids who will knock into it, hit it with a Frisbee (yes that did happen) it is not going to fall over. In all considering this is under 200 bucks, it has a high-end feel that I have seen in telescopes that are over double the price. I can honestly say that I was blown away by how well made this is. One thing I have to give Orion a high five for is that they have a YouTube channel which shows you exactly how to put this together. Now we have established that this is no budget telescope and that it is very well made. But how is it when it comes to stargazing? Well, we took it out on a very dark October night in San Antonio and thanks to the expanse telescope eyepieces that this comes with, you get an amazing 66 degree field of vision. Not even looking at the moon or Saturn or one of the other planets. Just looking up at the stars with this thing is incredible, even for me a guy who has looked at the stars a million times. The wide field view this gives you really is amazing and something I spent a lot of time with. Looking at things like the moon or if you are lucky Saturn or Mars are incredible thanks to the 75X magnification that this offers. 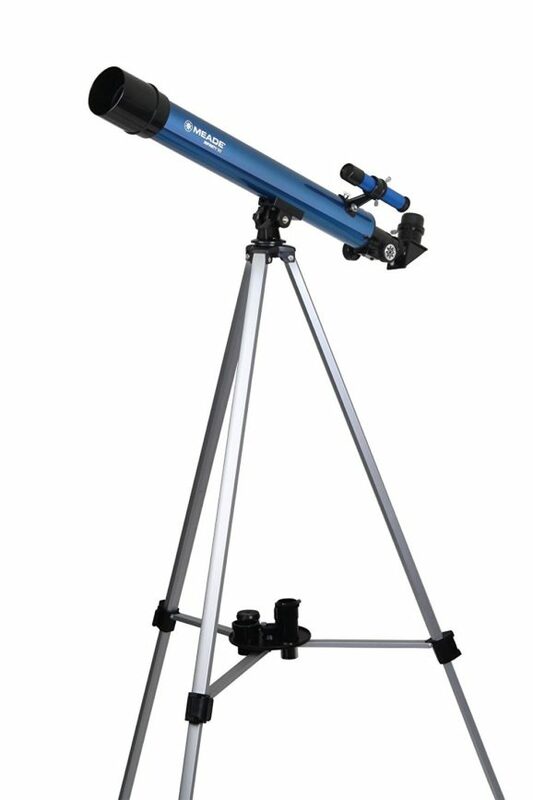 I know that the price may seem high to some, but I can hand on heart tell you that at under 200 bucks, this telescope is just incredible and the wide views that it gives you of outer space will really make you fall in love with stargazing. You will spend more time looking at empty space than planets! The first budget telescope I ever owned was a Meade so I always have a soft spot for anything with their name on it. This is the cheapest of the five telescopes we have looked at today. This particular version of the Meade Instruments Infinity 50mm AZ Refractor Budget Telescope can be found for under fifty bucks so it could be a great starter telescope. First thing, this telescope is not the easiest on the eyes. It has a kind of bulky and old school kind of style and for some, that is going to be very appealing. For me though, I am more about compact telescopes these days. Still, I must admit the metallic blue does look really cool. The tripod that the telescope comes with is very nice and despite the rather long stature of the telescope, it is very solid and stable which I was very impressed with. While this is one of the lower priced telescopes on the market, I can tell you that it is still very good for stargazing. With different lenses and different eyepieces, you can customize your night of stargazing to suit your needs. Some nights, you will be looking at the moon and this is where the Meade Instruments Infinity 50mm AZ Refractor Telescope really excels. But on those super clear nights, you can actually see Jupiter which I thought was really cool. The telescope is a little more fiddly to use, especially when it comes to focusing and actually moving it as it has a very, no nonsense up, down, left and right kind of movement which makes fine movements quite tough. Still, for someone new to stargazing, this does everything they will need it to do. Plus even with the low price, the clarity of the images you will be seeing is very, very good. For a seasoned stargazer or even someone who has had a telescope before, I do feel this may be a little basic. But for a kid or someone new to the hobby, it is great. Plus the low price makes it not much of a gamble. Ok so for a little bit of fun, I am going to put some of these telescopes head to head and give my honest opinion of which one I think is best. I will be straight with you and say that all five of these did a good job and no one would be upset with any of these. Still, let’s roll up our sleeves and put these head to head! These are two very good budget telescopes. 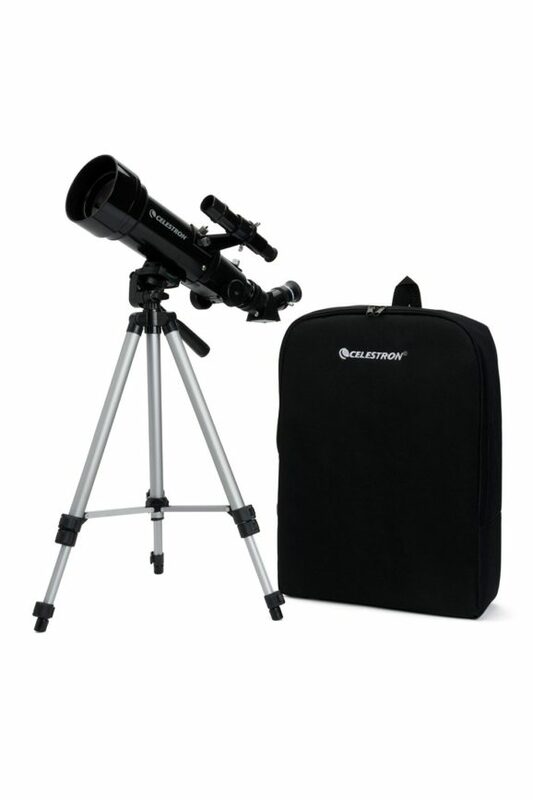 The Celestron model is nice as it comes with a carrying case which helps with the portability. The Orion though really is a fantastic gift set. It is aimed more at people who are new to the hobby or even a child. With this set you get the telescope which is very high quality and well made, not to mention easy to use and offers very nice and clear images. Do not get me wrong as you can see from my review up above, the Celestron 21035 is a good telescope. But I feel that as an overall set the winner has to be the Orion 10034. It comes with everything you need to start your stargazing journey. Plus for a kid, this would make a fun, educational and exciting gift. Next up, we have the more expensive Orion 09798 going against the Orion 10034. Which is a really hard battle. You I was just saying how great the Orion 10034 was in terms of being a first timers budget telescope. But the Orion 09798 is the better telescope. It is made with higher quality parts, a fantastic tripod and of course it has that 66-degree field of vision which makes looking into deep space one of the most amazing things you will ever see. This with its ease of use makes the Orion 09798 a truly amazing piece of kit. Some might be put off by the around 200 bucks price tag, but in all honesty, even if it was priced at 250 bucks, I would still consider this to be an incredible deal. You may be put off spending this kind of money for your first telescope or even for a kid, but if stargazing or outer space is something you have been interested in. then I cannot stress enough how much you will love this telescope. Ok so I know putting the most high tech telescope in the Celestron NexStar 130 SLT Computerized Telescope against the Meade budget telescope may seem a little harsh, but I thought it would make for a fun matchup. Let me be honest. In terms of quality and ease of use there is no comparison at all, the Celestron wins! But at a few hundred bucks in comparison to the Mead’s very low close to fifty bucks price tag, you have to ask is it worth that extra money. Part of me is screaming YES, it is. The Celestron offers crystal clear images and lets you see very close up images of the moon and even some planets as well. Plus the computerized nature of it makes stargazing as easy as possible. The Meade though while a little rough around the edges is a fantastic budget telescope that will open up your eyes to some of the wonders our solar system has to offer. Here I want to share with you just a few things to think about before you go and buy a portable telescope for yourself or even as a gift for someone else. Price: Always look at the price, especially if it is for a kid and it is their first telescope. It is awesome that you want to encourage your child to be interested in something that is not just fun, but also educational. But make sure you know if it is something they will have a passion for before you spend a few hundred bucks. Look at the five portable telescopes we have looked at today. You can see a few great examples there of how you can get a high quality portable telescope without having to take out a second mortgage. Portability: Or if you prefer size. The point of this article was to look at telescopes that do not take up a lot of space. Most of the ones we looked at were quite small in their size and take up very little room. This is great for storage and also for those who want to be able to pack it into the car and not have it take up a whole lot of room. Some telescopes actually come with a carrying case which is always a nice bonus. Ease Of Use: Always read a few reviews so you can get an idea of how easy the telescope is to use. Most of the ones we have looked at today will not cause you any problems. I personally think that starting off with a fully manual telescope is the way to go as you learn a real appreciation for stargazing. Then you can work up to having a computerized one doing all the work for you while you are having a cup of hot chocolate! Be sure to look at how easy it is to set it up as well. Most portable telescopes these days are very easy and just snap together quickly so you should not have any major problems no matter which one you buy. So What Is The Best Portable Telescope? 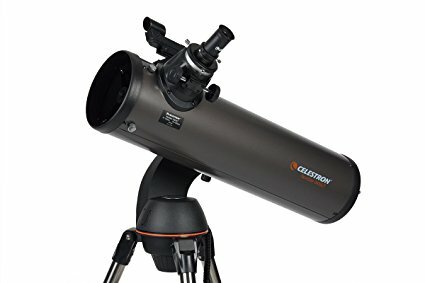 If you have plenty of money then go for the Celestron NexStar 130 SLT Computerized Telescope. It truly is awesome and I was sad when I had to send mine back, hopefully, Santa will have one under the tree for me this year. Likewise, I really fell in love with the Orion 09798 and its epic field of vision that it provided. In all seriousness though, most folks will not want to spend a few hundred bucks on a telescope, especially if they are just starting out. 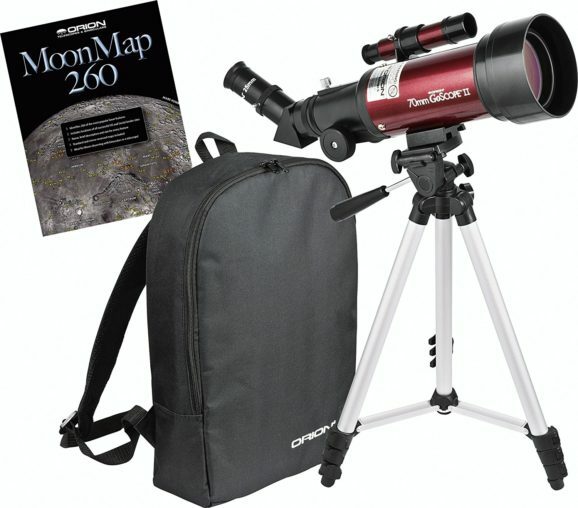 If you want to get the most bang for your buck then I would recommend you go for the budget telescope, the Orion 10034 GoScope II 70mm Refractor Travel Telescope Moon Kit. With its moon guide, carrying case and sharp images all for a very low price it is a very easy telescope for me to recommend to people who are new to the hobby, kids and even stargazers who just want a good quality backup portable telescope.